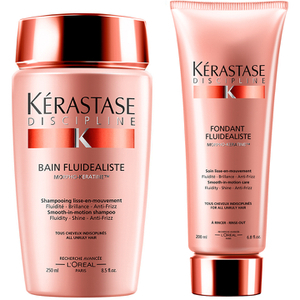 Choose this Kérastase Discipline Bain Fluidealiste Sulfur Free and Maskeratine duo for an innovative approach to great hair. This kit contains two products to get you started on a great hair repair schedule. 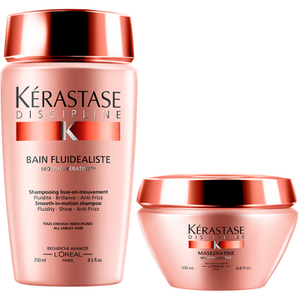 Smooth, strengthen and add bounce to your hair with Kérastase Discipline Bain Fluidealiste Sulfur Free. This product treats hair with amino acids and ceramide R for smoother and softer hair that looks youthful and vibrant. This product will leave your hair with increased flow and manageability with a pro-keratin formula that restores damaged hair from the inside out. True hair repair is possible with this innovative product. One of the best shampoos ever. Makes your hair silky smooth and manageable and fhe smell is amazing. 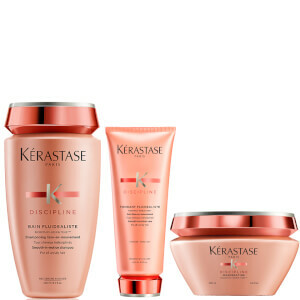 I’ve known Kerastase brand for a while and used different product range before. This one is by far k favourite! It really does a great job to keep my hair fresher and straight longer. It smells gorgeous! My hairdresser advised to use sulphur free products and I can see difference after trying this trick on my hair, stronger, less frizzy and softer. So glad I returned to Kerastase! I have to use sulphur free shampoos since I have regular Brazilian Blow Dry treatments, and tried lots of other makes for sulphur free. 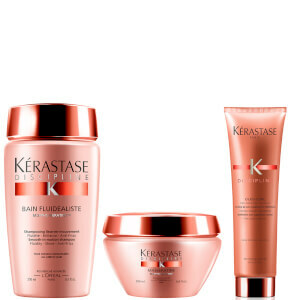 Back to trusted Kerastase - This helps soften your hair, it looks healthier and shinier. Use the blow dry spray as well! I have dry hair, it's a challenge to make it look smooth and healthy. This range does the job. Simply love it. Goog products!you don't need a lot of mask!I find if I put too much my wavy hair not have as much volume I like!I keep testing to see the results! The shampoo and maskertine which I use with the shampoo virtually daily like a normal conditioner have worked wonders on my dry ,curly, tinted hair and they smell wonderful too . Whilst like all Kérastase product they are not cheap they are in my opinion well worth the price tag . I have tried plenty of shampoos and conditioners but never fell in love with a product as much as this kerastase. I have curly hair and it tends to be very frizzy and dry but from the first usage I could notice huge difference! I blew dried my hair and even when it rained my hair didn't look that much frizzy as it used to be. Also the smell is super nice and makes your hair smell like you have just left a luxurious hair salon. Definitely recommend these products and wouldn't be buying something different than kerastase ever! My favourite hair products. It leaves my hair smooth, easy to manage and frizz free. I'd definitely recommend.